This is how it feels to come back from a 9 day west coast vacation. Kidding! I actually tried my best to eat in moderation on the trip so that I would still fit in my new white jeans for the summer. I ate what I wanted, just tried to eat smaller portions & if I felt full I stopped eating. There were definitely some days better than others…cough cough…the day I ate nachos, a hot dog & my weight in sushi. During my 2 days in San Francisco & 7 in Hawaii I was definitely guilty of putting every piece of sugar, carbs & crap I could in my mouth. So it is officially time to reboot my system & get back on track. In order to do that, its detox time! 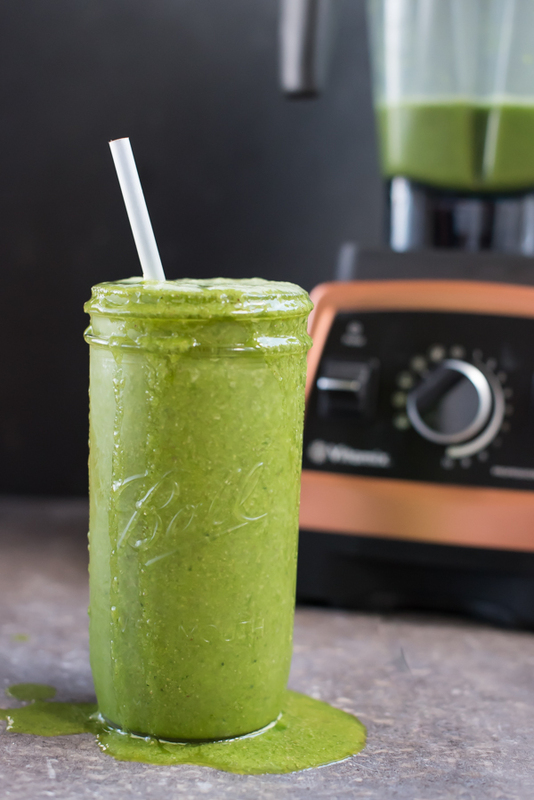 My favorite way to reboot after a vacation is with this Detox Super Greens Smoothie. It is jam-packed with healthy ingredients, makes you feel refreshed after you drink it & is great for your digestion! Most detox smoothies will add in different fruits to make the smoothie taste better but they are also filled with sugar! In order to reset your digestive clock you want to make sure you are adding a small amount of “good” sugar for taste but really sticking to lots of greens. I am obsessed with chia & flax seeds for digestion purposes so naturally I added them to my detox smoothie! The ice is completely optional. Depending on how cold your coconut water is or how you want it to taste you may opt out of adding it in. I like my detox smoothies to taste cold so I add in an extra handful of ice to make it colder. After I made them over the weekend, I caught him 3 times opening the refrigerator to sip on the extra smoothie I made for him “just in case.” I will make him a detox super greens smoothie convert, mark my words! Whether you are coming back from a vacation or just want to start your week off right, these detox smoothies are the perfect step in the right direction. Let me know how it goes if you make one! All the super foods you could want in one perfectly delicious detox smoothie! Into blender, add coconut water. After add chia seeds, flax seeds & agave nectar. Finally, add in your leafy greens (kale & spinach). Top with ice. Secure lid & blend until all ingredients are smoothly combined. Serve & enjoy!